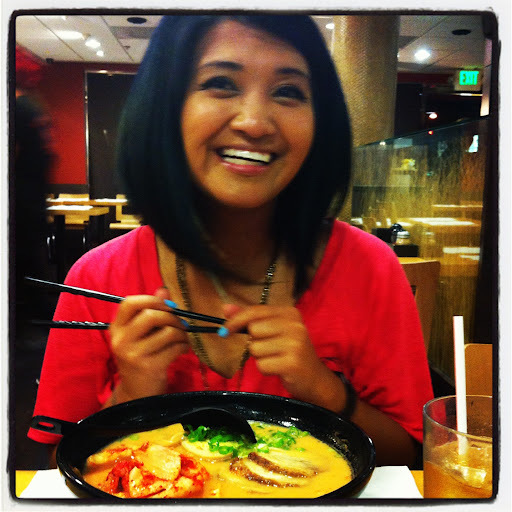 A few weeks ago (I know… this is late), my friend, Candice, and I had a little ladies night of ramen and drinks! We had been planning to do a ladies night for a while, with “Magic Mike” to go along with it, but they stopped showing that movie in theaters. Oh well, I’ll wait for it to come out on RedBox. We thought we’d check out Shogun Restaurant in La Verne, since she and I have had sushi there before but she has not tried the ramen. They only have ramen on Wednesdays and Thursdays, and since it was a Wednesday night, I thought it would work out perfectly! WRONG! I looked for the ramen in the menu and it was gone! They stopped making ramen there! That made me so sad… it was the best place to get ramen that was close by. We stayed for a bit to have drinks anyway. 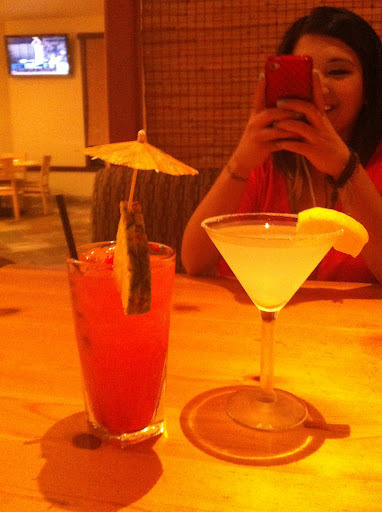 We are such asians… taking pictures of our drinks. Candice and I did not want to give up on having ramen that night so we checked to see what places would still be open that late in the evening. Our iPhones were not very helpful though, as AT&T decided to cut out their 3G at that moment, so I had to think of places from the top of my head. I was recently at Ajisen so I wasn’t so sure about going there again and Candice was recently at Daikokuya so we thought we’d avoid the two. But there really wasn’t anywhere else to go that late and I wasn’t up for driving all the way to downtown LA. So we settled for Ajisen in Hacienda Heights. I didn’t mind though, since they have such a wide variety of ramen and this was a chance for me to try something different. We both ordered the kimchee ramen. I was never a big fan of kimchee until last year and have only had kimchee ramen in the packaged form. Totally tastes different from the actual thing, of course. But I enjoyed the ramen very much. The kimchee itself wasn’t as pungent and spicy as I thought it would be. I liked the miso broth that it came in along with the tender slices of pork. The egg was overcooked, as Candice pointed out that night and the other time I was there with her. I don’t think Ajisen figured out how to cook their eggs. I couldn’t finish the broth though, I knew I would swell up if I did! There we go again, being all asian with food pictures! After ramen, it was still early and we didn’t want to go home yet so Candice suggested we go across the street to Banana Bay for drinks. I had been there before for food but wasn’t too crazy about it. We got there and it took a while to find parking. It’s a pretty happenin’ place on a Wednesday night apparently. We must have circled the lot a few times before we found a really tiny parking spot. We sat at the bar the whole night and ordered just a round of Long Beach Iced Teas or Hello Kitty or something like that. The drinks were pretty strong so I can’t remember. It was happy hour so drinks were pouring from the bar into the hands of college age folks, and there were tons of them there that night. 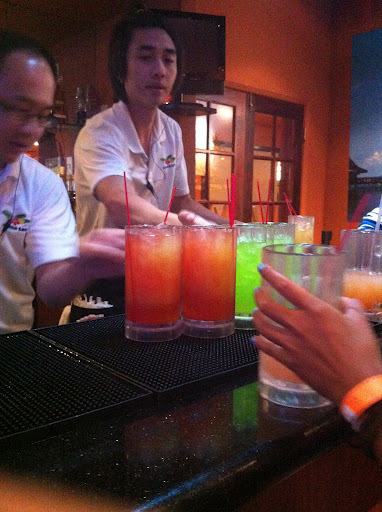 If you’re ever in the area past 10pm, their happy hour has great deals on drinks, and they give you a lot. I think our two drinks was only $8. The drink I can’t remember… the name of. 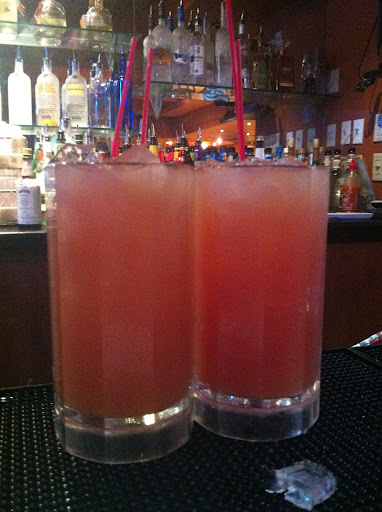 I remember those drinks, trust me! 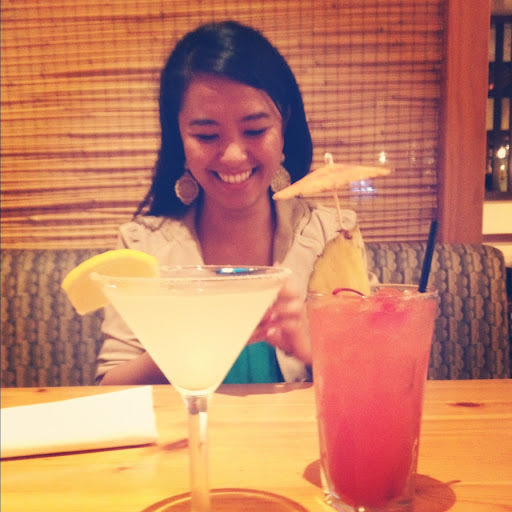 Brightly colored drinks and a server with a funky hair do! We were really fascinated by the server with the funky hair do. He had the sumo wrestler hair going on. I kept trying to snap photos of him all night but I’m not a good enough “creeper” to do so. Angie… This photo doesn’t do it justice. You had to have seen it from the side. I was pretty buzzed but not drunk enough to ask to take a photo with him. Now that I look back at it, I don’t really see why his hair was so fascinating, but I can blame it on the strong drinks we had. We were all done and sobered up by midnight. I’m glad Candice and I finally got around to our ladies night since we had been planning on it for a while. It was just too bad that Shogun stopped serving ramen, I think people would have loved the ramen there. 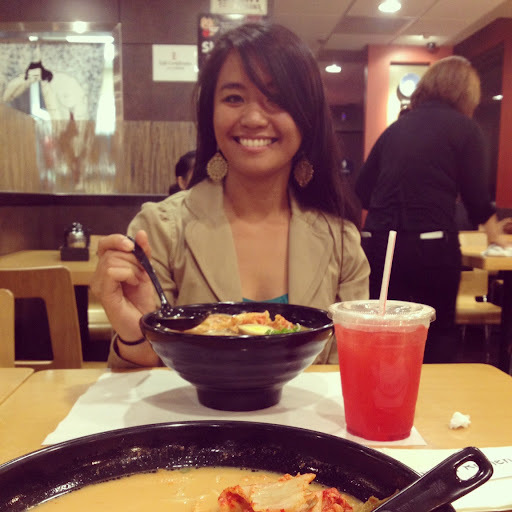 Candice really loves ramen and goes on her own ramen runs, converting other ramen newbies. My evil plot to take over the world is working!!! Just kidding. Her mother was telling me before we left, how often Candice goes out for ramen, and she even makes ramen at home all the time. The top ramen kind. She’s very likely to show up in more ramen run blogs in the future. Anyway, thanks for reading. Now I want to eat ramen again. Ugh.